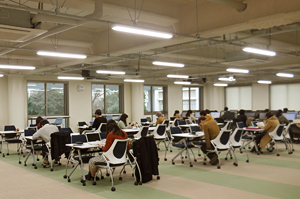 Saitama University gathers various documents necessary for education and research, while at the same time establishing an informational environment at the Saitama University Library. 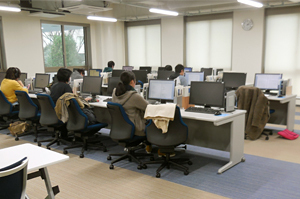 When school is in-session, the Saitama University Library is open every day including Saturdays, Sundays and national holidays. 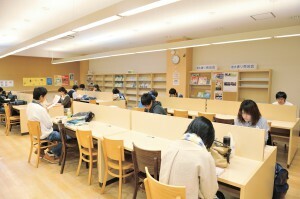 The Saitama University Library owns and provides not only a collection of more than 850,000 of books, magazines and newspapers, but also audiovisual materials such as CD-ROMs, videos and DVDs, etc. Moreover, the Library provides learning materials for international students and students who are to study overseas. In a reference room, there are information terminals where students can access the internet for various databases, and electronic journals for writing papers. In reading rooms, students can bring their own personal computers and use the internet, and write papers by connecting via ethernet ports or via wireless LAN. Moreover, there are CD-ROM terminals and terminals designated for the use of OPAC, which enables online searches for the collections held at the University. On the third floor, there are large and small meeting rooms, as well as music appreciation rooms. On the second floor, there are conference rooms, meeting rooms and Japanese-style rooms. On the first floor, there is a lobby, a lounge and a convenience store (Lawson Saitama University Store), with a space where students can eat and drink. 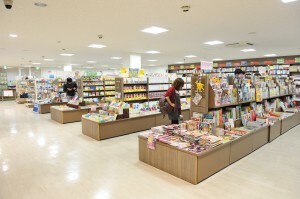 Moreover, there is the “University Information Zone” in the convenience store, where University publications are displayed and distributed. 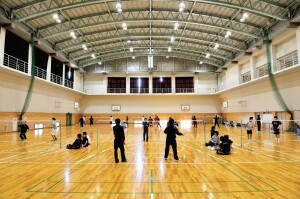 There are Gymnastic Halls, Martial Arts Hall and the Japanese-Archery Field. 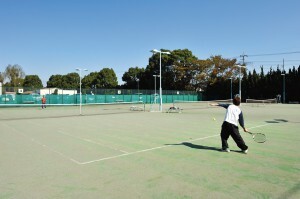 In addition, there are outdoor facilities such as athletic fields, soccer fields, baseball fields, rugby fields, 6 tennis courts fully equipped with night game utilities, and a pool. 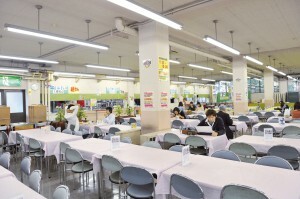 There are two students cafeterias; Keyaki Hall (First Student Cafeteria) and the Second Student Cafeteria that provide a reasonably-priced abundance of delicious dishes. At the University Co-op Store on the second floor of the Second Student Cafeteria, students can purchase books, school supplies and other necessities. There is also a service counter where students are able to apply for various qualification examinations/tests and to look for housing. Moreover, Saitama University-logoed goods are sold at the University Co-op Store. Saidai Spot is a comprehensive counseling center, where students can casually consult with counseling staff when they have concerns and questions regarding student life. Full-time counseling staff will respond to any issues regarding education, relationships with friends, future career paths, health and daily lives, etc., through direct consultation with students. Why don’t you consult with us instead of worrying by yourself? Saidai Spot will support your student life. 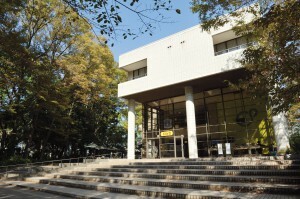 Moreover, students can browse an informational magazine regarding Saitama University. Please feel free to stop by and talk to our staff. In order to help students manage their health, the Health Service Center provides students with not only routine physical examinations and urgent care, but also health consultation and mental health counseling.